They try and try but they can't get rid of us! I think we can get past these Cubs. I wore my shirt last night and we won. 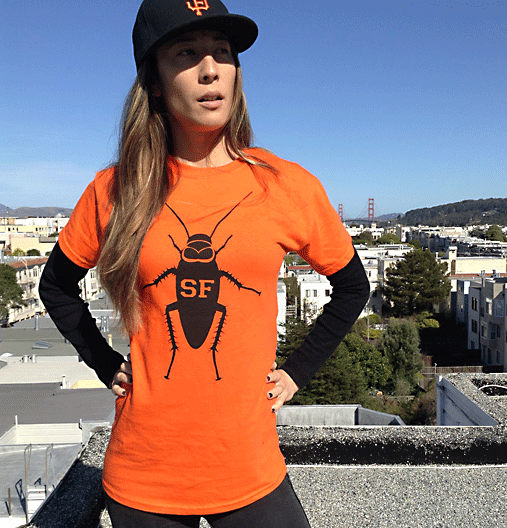 Get your original San Francisco Giants Cockroaches T-shirt! It just feels good. Designed and printed in San Francisco by a local artist. Maddon had drawn his line in the sand. Then he watched baseball’s cockroaches scurry across it. The Cubs still are sitting pretty, leading this best-of-five NL Division Series 2 games to 1, with Game 4 at AT&T Park (8:40 p.m. ET, FS1), but it gets a little scary knowing that the Giants are like cockroaches that just can’t be killed. unworn item for a full refund less shipping charges within 15 days of purchase.